Tuesday • October 7 • 2014 Volume 81 • Number 40 INSIDE: Campbell’s n Menards n Employment n Dining n Presorted Standard US Postage Paid Permit #8 ECRWSS Vermillion, SD Bomgaars n One In A VerMillion n bp Broadcaster Press Postal Patron Local Since 1934 201 W. Cherry n Vermillion, SD 57069 n Phone: 605-624-4429 n Fax: 605-624-2696 n www.broadcasteronline.com PHEASANT HUNTERS Prices Good until October 31st The Challenge! The Thrill! The Excitement! Get Ready for Action with these Specials! Super Special! Franchi Renaissance O/U Shotgun Save 30000 on any in stock. while supplies last. 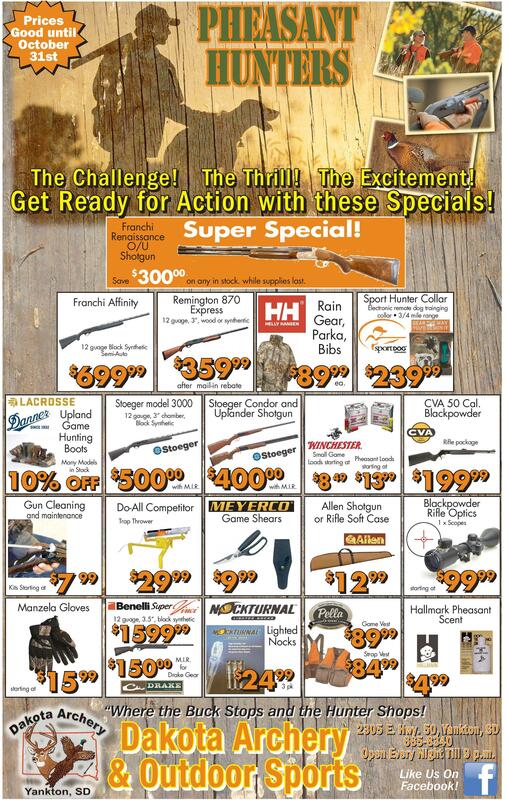 $ Remington 870 Express Franchi Affinity 12 guage, 3”, wood or synthentic 12 guage Black Synthetic Semi-Auto 359 $ $ 699 $ $ Upland Game Hunting Boots Many Models in Stock 99 99 12 gauge, 3” chamber, Black Synthetic $ $ Gun Cleaning 7 00 00 with M.I.R. Do-All Competitor and maintenance $ $ 89 $ $ Electronic remote dog trainging collar • 3/4 mile range 239 99 99 $ $ ea. 99 99 Stoeger Condor and Uplander Shotgun CVA 50 Cal. Blackpowder Rifle package 10% OFF 500 Kits Starting at 99 99 after mail-in rebate Stoeger model 3000 Sport Hunter Collar Rain Gear, Parka, Bibs Trap Thrower 29 $ $ 99 99 99 99 Small Game Pheasant Loads Loads starting at starting at 00 40000 $ $ with M.I.R. 9 99 99 12 $ $ 99 99 Manzela Gloves 12 guage, 3.5”, black synthetic 1599 $ $ starting at 15 $ $ 99 99 99 99 M.I.R. for Drake Gear 00 15000 $ $ 99 19999 $ $ Blackpowder Rifle Optics Allen Shotgun or Rifle Soft Case Game Shears $ $ 99 49 $ 8 49 $1399 $ $ Lighted Nocks Game Vest 89 $ 99 $ 84 99 $ $ 1 x Scopes starting at 99 9999 $ $ Hallmark Pheasant Scent 99 99 Strap Vest 99 2499 $ $ 3 pk 4 $ $ 99 99 “Where the Buck Stops and the Hunter Shops! Dakota Archery & Outdoor Sports 2305 E. Hwy. 50, Yankton, SD 665-8340 Open Every Night Till 9 p.m. Like Us On Facebook! See what’s brewing on the job market. hatch FURNITURE Semi-Annual FURNITURE Help Wanted Section Now thru Sunday, Oct. 12th with specials Hours Sunday, 11am - 5pm EVERYTHING MUST GO!